Board certified by the American Board of Obstetrics and Gynecology, Dr. Vogler specializes in providing comprehensive, personalized women’s health care that encompasses the special health issues women face from the teenage years to menopause. Her practice includes preventative health, contraception and STD counseling, and management of abnormal pap smears and HPV. 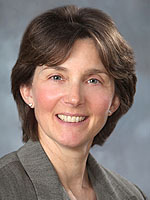 She provides measures to reduce the symptoms and discomforts of peri-menopause and menopause, including medical options and minimally invasive surgical techniques such as laparoscopy and endometrial ablation, to control abnormal bleeding patterns often experienced in mid-life. A graduate of New England School of Osteopathic Medicine, Dr. Vogler completed an Obstetrics/Gynecology residency at St. Francis Hospital and Medical Center in Hartford, CT. She is a certified Menopause Practitioner by the North American Menopause Society.